Are you looking for a gift to buy for your children? What about getting them a remote control car to race and have fun? Actually, buying an rc car for your kids is not only for the sake of buying it, but you buy it because it provides many benefits to the growth of your children. The best ones offer a lot of fun while also help to develop both cognitive and motor skills of your beloved ones. In this article, our team has picked up the top 10 best remote control cars in 2019 that are actually designed and constructed for kids to enjoy. If you are looking for a set of rc race cars for your kids, Sharper Image Remote Control Car is what we recommend as a 10th ranking on our list. It comes with a pair of red and blue race cars that have a kid inspired design to entertain your children. Coming with 3 controlling buttons, it allows users to steer, turn left or right, and bump. The set also arrives with 2 remote controls which means that it allows for 2 users to challenge one another. To better entertain your little ones, Sharper Image Remote Control Car is also built with crashing sound effect. This one from Hapinic might be one of the off road rc cars that come with affordable price and good construction. Built with solid plastic and electronic metal, this racing car promotes durability and allows your kids to have fun racing and crushing. It also has a control range of about 100 M which is wide enough for your kids to keep tracking their cars. This off road car also comes with 2 rechargeable batteries that allow you to take turn charging and using. Each battery lasts up to half an hour, so you children and enjoy racing with their friends to the fullest. 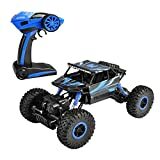 Force1 Wall Climbing RC Car might be one of the most exciting toy cars for kids that can race amazingly on the wall and ceiling. It is built intensively with gravity defying and vacuum-power technology that enable the car to go all the way from the floor to the wall. 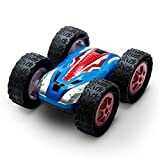 Made of top quality plastic and steel, it seems lighter and sturdier than other regular RC cars.The car also has a rechargeable battery which can be charged over and over again once it dies out. Coupled with USB quick charger, both remote control and car will be fully charged within no time. This one is a set of two small rc cars that feature built-in drivers on the top. They come in green and red colors which means that 2 player mode is there. 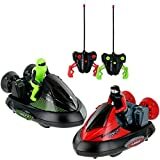 With dual remote controls, Click n’ Play Remote Control RC BAttle Bumper Cars allows your children to have fun racing with their friends. This set has 3 buttons on the controllers which give more options such as turning, bumping, steering, to the race. It provides even more fun to your little ones as it makes rider to fly away once the car is crashed. There are also many crashing sound effects that turn racing game into something more realistic. If you are looking for a remote control cars for girls, this Jada Disney Junior Minnie Mouse is what suitable. 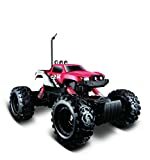 With a very cute pink and purple construction, this remote control vehicle looks good with your baby girls. Moreover, it comes with a kid inspired design that features a mickey mouse driver inside the car. With 2 pressing buttons on the controller, this toy allows your kids to ride straight forwards or spin left or right. It has a normal riding speech that is built with 270 MHZ. 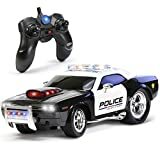 This one from KidiRace is one of the fast remote control cars that features police car design. Inspired by kid-friendly controlling, the controller comes with 3 buttons along with an easy-to-hold construction that will not slip. Built with 2.4 GHz technology, its remote controller allows your kids to control over multiple cars with a far and fast range. Besides, both the car and controller come with rechargeable batteries which you can always recharge them with an attached USB charger. Furthermore, this rc car has a built-in light and sound effect to make it become even more real during the game. Force1 has always been a brand that builds different cool rc cars with quality. This one is known as Force1 USA Toyz RC Car which carries out so many good features your kids would love to have. The toy car has 4 big rubber tires that contribute to smooth movement. It has a very solid and durable construction which allows the car to flip, spin, and crash with confidence and fun. More importantly, it has a dual sided design which lets the kids to turn to any side and continue playing without any problems. 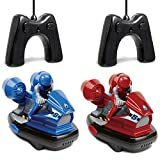 A long battery life is also what makes Force1 USA Toys RC Car become an option to most players while its fast charger quickly charges the battery for another ride. This one is the best rc truck from Click N’ Play company. Thanks to its well built construction, this product allows your kids to fully enjoy racing and crashing it at their convenience. Made from top quality plastic and metal, this rc vehicle has an ability to go against corrosion. Although it looks sturdy, it is very lightweight on hands which makes it more convenient for your little children to move it from place to place. On top of that, it has a very kid-friendly button which makes it easy for your kids to control it. Constructed with dual powerful motors, this will go all the way up to 6.2 miles with the speed of 10km/h. 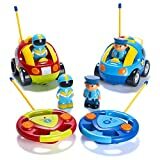 This one is a very cute set of rc police cars that are made specially for toddlers. It comes with a very color design which catches your eyes from the start. Furthermore, it also features toy drivers on the car that makes it look more fun to your kids. Its easy-to-control remote makes it more useful for the purchase as your toddlers can easily pick up learning how to play with it. Alongside with that, there are also different sound effects including siren and honking sounds to entertain your children during the race. There is also a light indicator on the remote to let you know whether it is turned on or off. 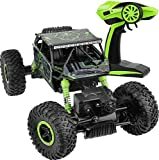 Maisto RC Rock Crawler Radio Control Vehicle is the top ranking product that comes with both strong construction and great functionality. Its exterior construction is highly made from tough materials which makes it last longer than other toy vehicles. Besides, it comes with double motors which makes it powerful enough to travel like a real off-road car. Its low gearing system helps to enhance the speed and makes the vehicle go like a snap. Built with TEP tires, this helps the car to better grip the surface. As for the remote, it is constructed from trip-channel transmitter technology which players can use it to control multiple cars at once. 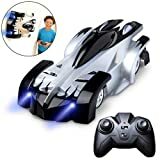 Getting a remote control car for your kids can be a very useful gift for them. This is because a smart and sturdy one can help develop your kids’ brains as they grow. All of the products above are the best picks in 2019 because they do not only come with tough construction, but they also have a very smart controlling system that makes it easy and joyful for your children.